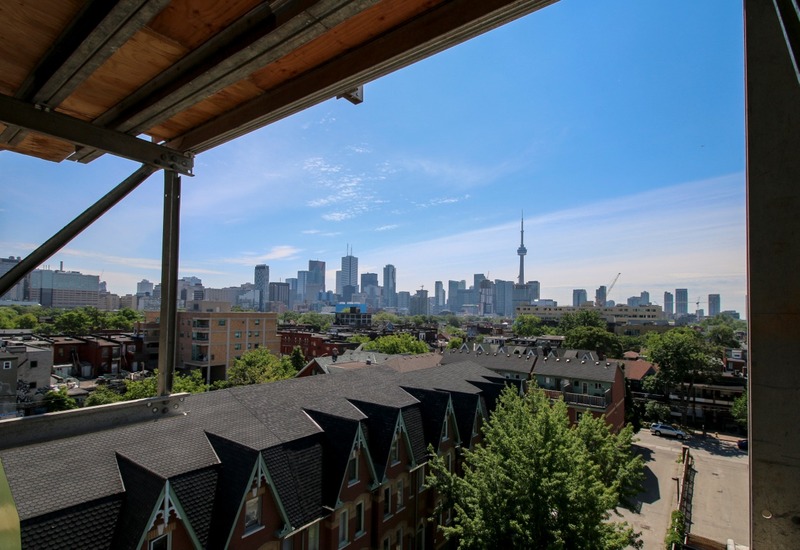 Like many construction sites in Toronto, The College Condominiums experienced a tough winter with extreme weather and cold temperatures. But that hasn’t stopped developer, Tribute Communities and their contractors from keeping the project right on schedule. BuzzBuzzHome News dropped by the site this week to take a tour, snap some photos and check in on the action. 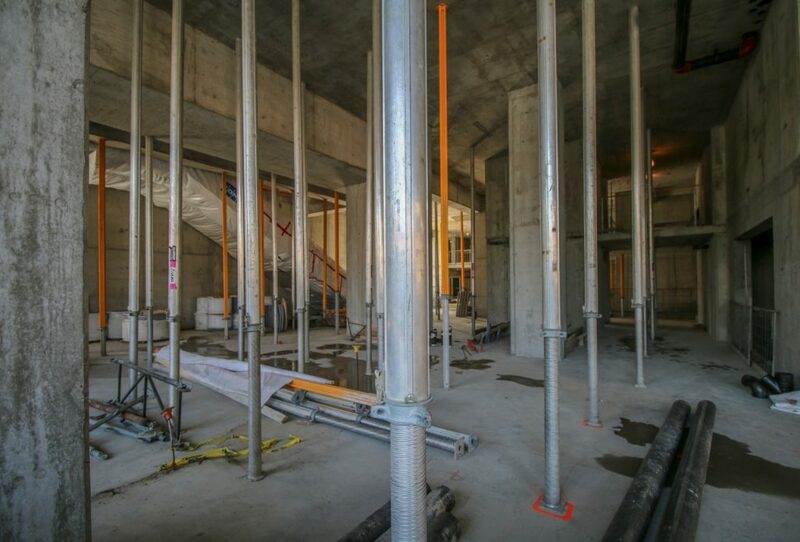 Located near the corner of College and Spadina, the future 15-storey tower has now reached the fourth floor where workers are pouring portions of the fourth floor slabs as well as the concrete verticals from the fourth to the fifth floor. 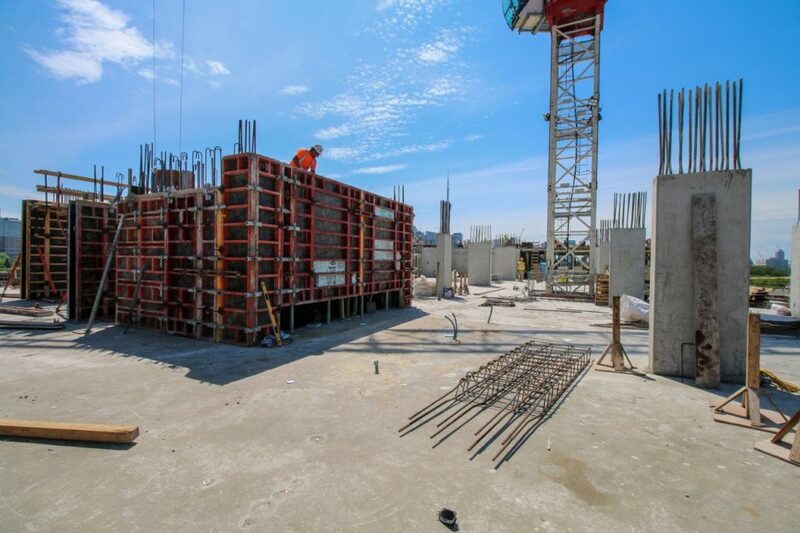 Crews will continue to work their way up the rest of the residential floors until the roof is poured and the project is topped off later this year. Exterior glazing is expected to start around August and the structure should be fully enclosed and watertight within a month of topping off. 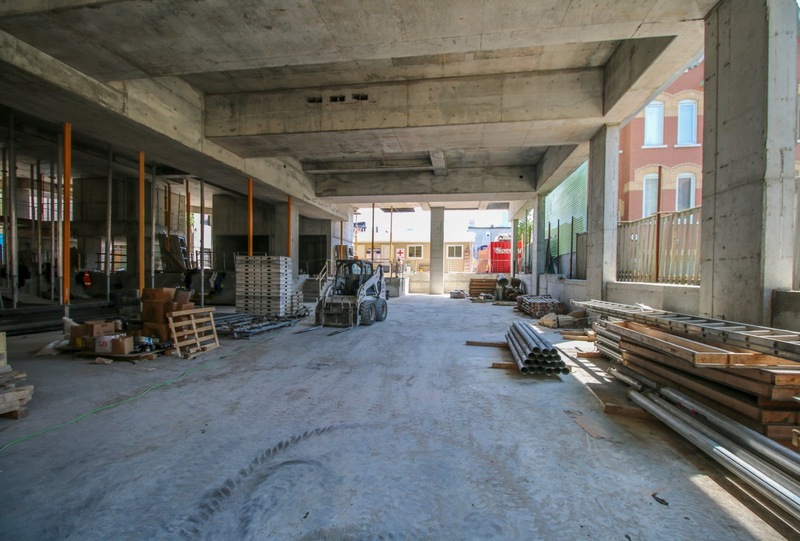 The west side laneway leads to the loading dock and underground garage which will provide three levels of retail and residential parking. The laneway itself will eventually be reconstructed, paved and widened for easier vehicle and pedestrian access. 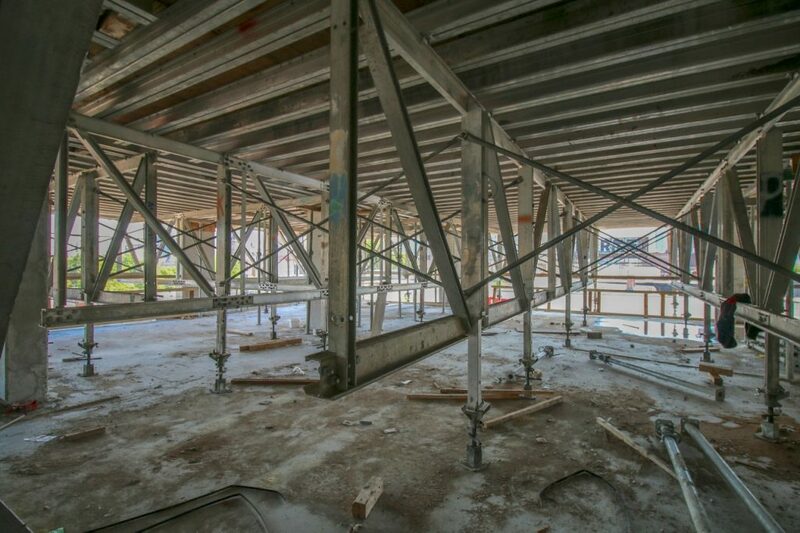 Over on the second floor, you can really start to see the expansive retail space taking shape. This area will be home to a brand new Independent City Market grocery store and will add 20,000 square feet of grocery space for residents. And, since the retail portion is a completely separate entity, this very convenient amenity won’t cost residents a penny in their condo fees. Another retail space is also available on the west side of the ground floor. Tenants have not been confirmed yet, but with such a great location, it shouldn’t be too difficult of a task to find one. Also on the ground level is a small community space that has been committed to the City of Toronto, though it hasn’t been confirmed what it will be used for. With Kensington Market nearby, the space could be perfect to display local art or house a small gallery. The rest of the ground floor will consist of the lobby and concierge desk, residential elevators, as well as the escalators leading up to the grocery store. 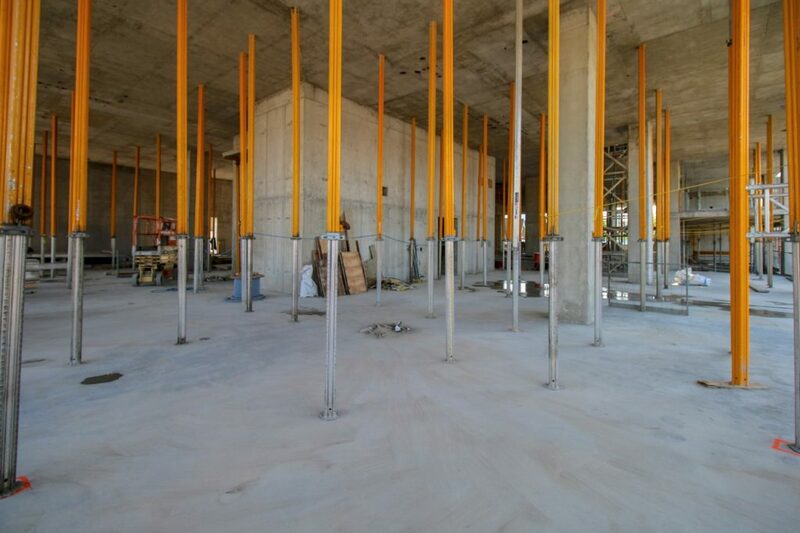 The other amenities are all located on the third floor and will consist of a fully-equipped fitness centre, party room, theatre, and billiards room. On this level, concrete has been poured and is presently curing. When completed in 2016, The College Condos will house 226 units with interiors designed by Bryon Patton & Associates. Standard features and finishes include nine foot ceilings, laminate flooring in main living areas, quartz countertops and glass mosaic backsplashes in kitchens, and porcelain tile floors in bathrooms. Sales at The College start at $343,990. 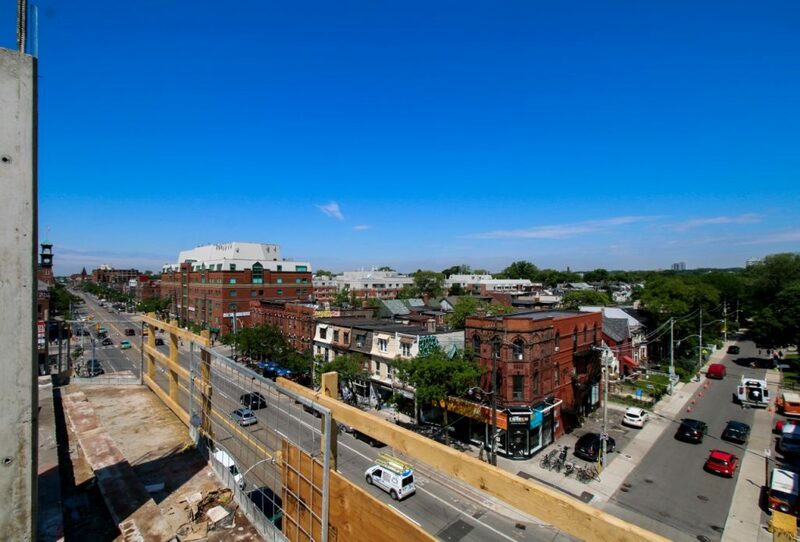 Prospective homebuyers can visit the presentation centre located across from the site at 306 College Street for more information on available units. For more information contact 416 363 4800 or email thecollege@tributecommunities.com.